Hip pain: Hip pain is the sensation of discomfort in or around the hip joint, where the upper end (head) of the thigh bone (femur) fits into the socket of the hip bone. 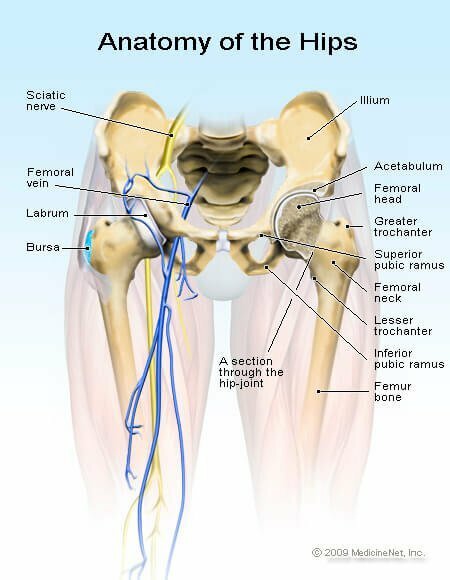 Hip pain has a number of causes, most of which are related to degeneration, injury, or inflammation of the muscles, bones, joints, and tendons located in the hip area. Common causes of hip pain include arthritis, bursitis, bone fracture, muscle spasms, and strains. Hip pain can also result from disorders causing pain radiating from the spine and back, such as sciatica and herniated discs. A theory of hip pain that turns into arthritis of the hip is femoral acetabular impingement disorder. The condition is theorized to cause hip pain in early stages of arthritis.